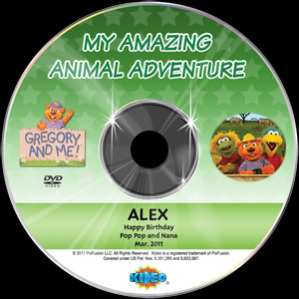 This Personalized DVD is filled with music, wild animals and exciting jungle scenes as your child and Gregory embark on a safari! Watch and enjoy as Gregory tells stories about their safari together and as your child performs with Gregory in Animal Antics. Journey down the jungle river in search of the mighty Lion and take an underwater voyage as your child swims with Gregory amongst sea creatures such as turtles, starfish and dolphins. This video is a terrific tool for learning about animals while promoting the value of friendship.